I’d never really thought of myself as the fairy sort, but there was no denying the little creatures of light that flitted in front of me. Gold and silver, all shapes and sizes; they were like spider silk floating in the air, something you can only see when the light hits it just right. But somehow, I could see them completely. They seemed excited, pressing in close to me as if they wanted to touch me instead of the other way around. I rubbed my eyes, trying to re-orient my contacts. But the little glittery things didn’t go away. I drew a quick breath thinking I was about to faint. With a POP! they disappeared like soap-bubbles bursting, with tiny residual traces drifting off in the wind. The faint, familiar rumbling laughter of a man rang in my ears though I was clearly alone, standing between ancient portal stones, breathing in the scent of green pastures, farm animals and the sea. I was visiting Dromberg Stone Circle on a whim. 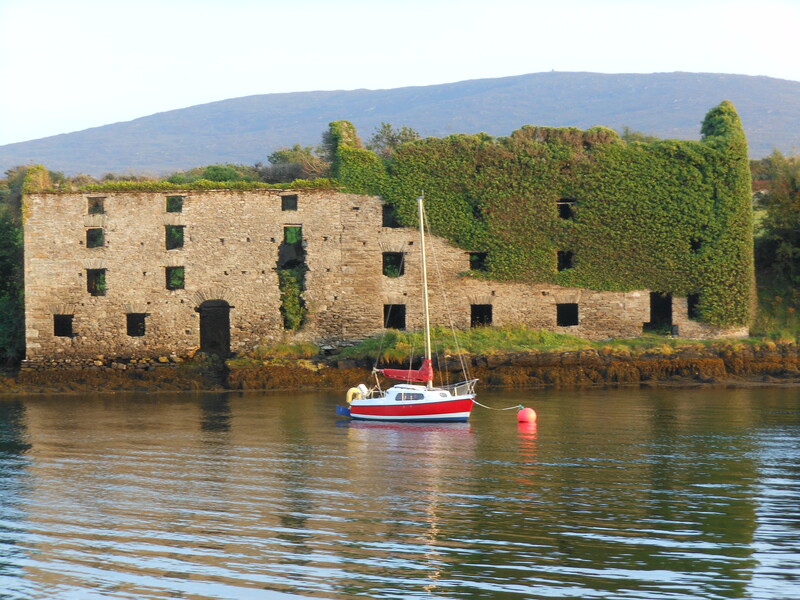 Located in an out-of-the-way nook in south-western County Cork, I hadn’t done research ahead of time or talked to anyone who had been there. There was no real reason for the strong pull I felt to visit the site marked by tiny lettering on the map I kept over my knees like a blanket. But even so early into my Ireland adventure, I’d learned to trust these urges and so we pointed the little blue Skoda east. The night before, Neil and Ed and I arrived late under a full moon at a stone “butter house” perched between a crossroads and a vast moor on the edge of a bay. Sheep’s Head Peninsula, or Muintir Bháire, was to be our “home” for a couple of days as we each explored the region in our own way. Ed and I spent the day hiking a well-marked ridge line trail, part of the 88km Sheep’s Head Way loop that rolled gently through heather and grass-covered pasture and hillside. Despite it being September, the weather was balmy and I wished I’d thought to wear shorts and left the sweater at the house. The silence was a wondrous thing, a comfort to my city-tired soul. The wind had few trees to rattle against and it passed us by gently. There were no cars or airplanes and even the birds kept their thoughts to themselves. At one point, the sound of unseen bees was loud enough to make me wonder if we had unknowingly wandered into a hive as large as a house. It is a simple and unspoiled place; there are places to see—dùn’s and caishils, Lady’s Wells, standing stones and burial grounds, but what I had come for was this silence. We saw many times more sheep than people in our five-hour hike, climbed over a dozen or so ladders straddling barbed wine fencing between pastures, and often stopped to sit in the heather, watch Painted Lady butterflies or just breathe. Our only sign of “civilization was the cluster of plain white rectangle homes that made up the southern-most “village” of Tooreen. A cafe there offered a delicious salmon sandwich I ate at a picnic table outside. On our return we stopped again for coffee and fresh scones and apple cake with cream while we waited for Neil to pick us up. It was a day without sharp upticks on the awe-meter, instead the beautiful scenery rolled out simple and smooth as the wind and water worn rocks of the land. 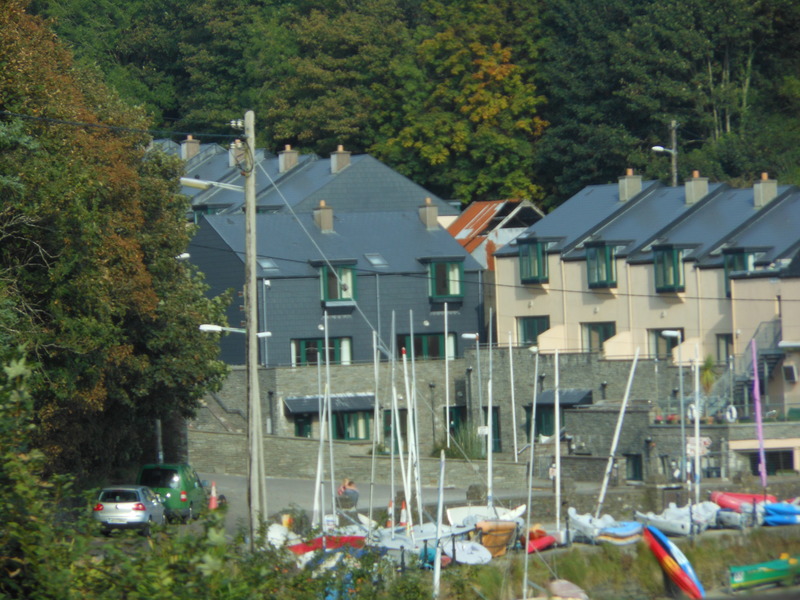 As if to prove just how small a two-way road could become, we merged on to a narrow track running along Glandore Harbor that brought us through a fishing community so pristine it seemed plucked from a movie set. Boats of all sorts rested at anchor, their brightly painted sides reflected in water so clear we could see the bottom nearly all the way across the harbor. Picturesque as it was, it remains only a memory, as the road provided no space to pull over to take photos. Weaving along the waters natural edge, the road had no passing room, much less a shoulder to turn out on and there were too many turns to make stopping in the road itself a safe option. The small empty gravel parking lot surrounded by split-rail fencing revealed nothing of the circle itself. 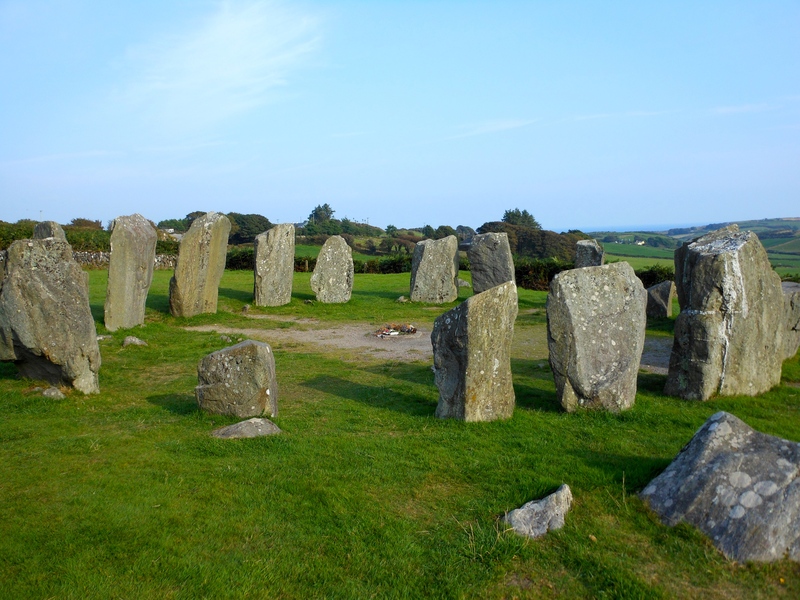 Nor did it hint at the fact that Drombeg is one of the most visited stone circles in all of Ireland. I bounced eagerly from the car, skipping down the path lined on either side with towering fuchsia and blackberry bushes. Neil and Ed hung back, allowing me my first stone-circle sighting alone. The path turned sharply, opening out into expansive fields in various shades of green that tumbled off into the sea, miles away. 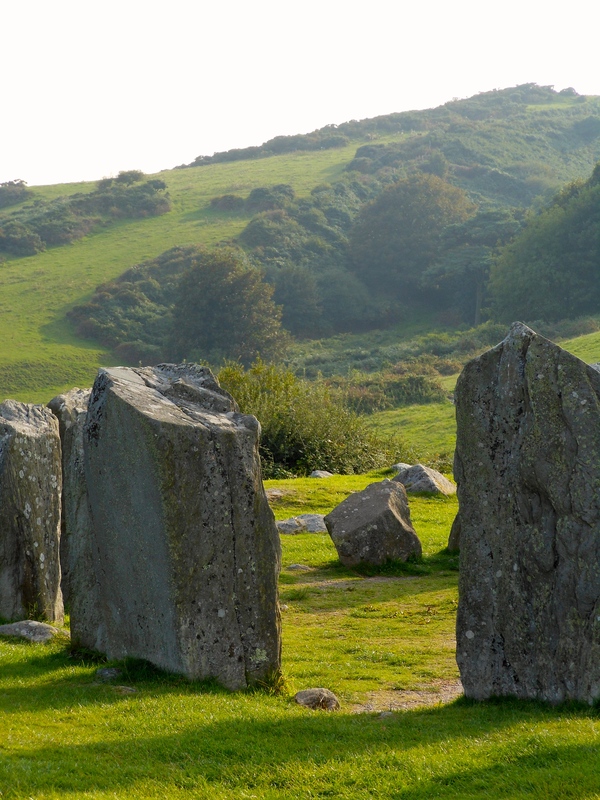 The circle of grey stones ranged in height from the nearly six feet of the portal stones of the eastern entrance to the perhaps four foot tall stones that flanked the opposing horizontal axial stone in the west. 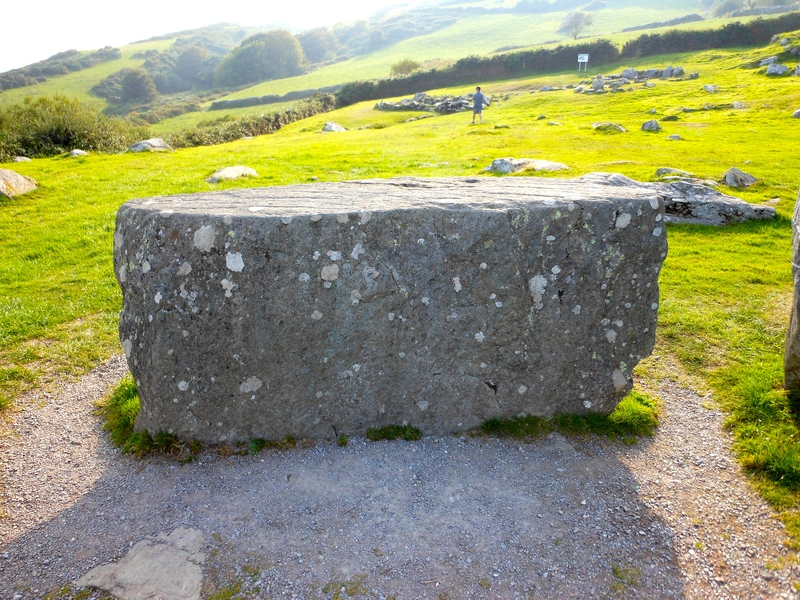 The stones were aligned in such a way that as the sun set on the Winter Solstice, it would fill a natural notch in the stone of the western hill, casting a beam of light that lined up directly with the axial stone to the west and between the eastern two portal stones. Strangest of all, it was constructed in the middle of land in which other stones of the sort were glaringly absent. Its sweeping views of what was now farmland made the place an obvious site for something important but also revealed the improbability of its construction.Where had such enormous stones come from and how did they come to be rooted there? It seemed both out-of-place and completely at home, far away from anything that would have historically been considered “civilization”. I bypassed the usual signs explaining what a person should find interesting and entered the circle between two towering stones directly across from the long, recumbent altar stone on the opposite side. As I stepped over the threshold, I will filled with sudden certainty: I knew this place. It was as familiar as my land back home, a wholly unexpected sensation that made me feel as if I’d been knocked sideways by an unseen hand. But before I could wonder over it, flicks of light, small and large, some round and white-flashing, others sliver and sleek like minnows caught in the sun, appeared in the air before me. There were more than I could count, only an arms reach away. They’d descended with speed, their rushing welcoming, as if they’d been waiting, wondering why I had taken so long. I gasped, my sharp intake of breath a rock thrown into the clear pool of this vision. I blinked and they were gone. I could hear Neil and Ed making their way down the trail slowly. I hadn’t been standing there long, but it seemed like hours. I didn’t understand what was happening, but perhaps it would have been more strange if I hadn’t experienced some magic here. Shaking off the strangeness of it all, I moved to the more recent altar constructed in the center of the circle. On a flat stone offerings had been left—slips of paper and ribbons, money and candles and tiny tokens —just over the place were archeologists discovered the remains of much more macabre ancient offerings. I reached into my pocket and drew out a stone. Blush pink and warm from being carried for days, it had come from my garden on a hunch, brought to make just such an offering: from me to you, in thanksgiving and joy over our reuniting. I laid the stone in the center, unexpected tears in my eyes. Turning back to the portal where I’d entered, I stepped in front of the first stone to my right, closed my eyes and placed the palms of my hands on its uneven, sun warmed surface. I listened and prayed and said thank you and moved on. One by one, the stones passed beneath my hands and seemingly through me. Each had a different story to tell, each a different voice, each a different touch. All as familiar as the skin on my hands that caressed them. As I laid both palms flat against the recumbent altar stone facing west, a warm surge of energy rushed up my arms leaving them tingling and more alive than they had been before. I ran my fingers around the edges of small hollowed out areas in the stone—containers for some ritual long forgotten—searching for some indication in this life of what it all represented. I floated between something known and unknown as I completed the circle, touching each of the seventeen stones, agitation rising as I struggled with the frustration of not remembering something important, even though it didn’t seem possible it was mine to remember. Tourists burst through the hedge path and into the site, their laughter and lack of subdued respect further annoying me. I wanted to remember whatever it was that niggled at the edges of my mind. I wanted to dig into the sacred history of this place that had been called Druids Altar by the ancient people. And I wanted the Black Sabbath t-shirt clad idiot running around the field to show some respect—this was a church after all. Or at least a church of some sort, for some ancient people—maybe even mine. The rumbling laugh echoed again in my head and a deep voice, filled with compassion and amusement said, The past isn’t for you. It is in the now where your power lies. I wanted to cry. It was the same inner argument I always had — I feel like I have work to do, a role I am here to fulfill, but I don’t know how to begin. Or maybe I do, but I don’t trust it. Either way, having a “purpose” beyond meeting basic needs and a little fun now and then seemed like an extravagance in my urban everyday world. I don’t understand. I don’t know what I am supposed to do. I always said the same thing, but this time an answer seemed closer. The window to something else seemed like it was opening, though it was still too dark to see. You will, he laughed, warm and throaty. You will. Swallowing the lump that had formed in my throat, I joined Neil and Ed, wandering the site like the other tourists that had suddenly filled the field. I put the voice and the “things” I’d seen aside, knowing I couldn’t make someone else understand something that was odd even to me. 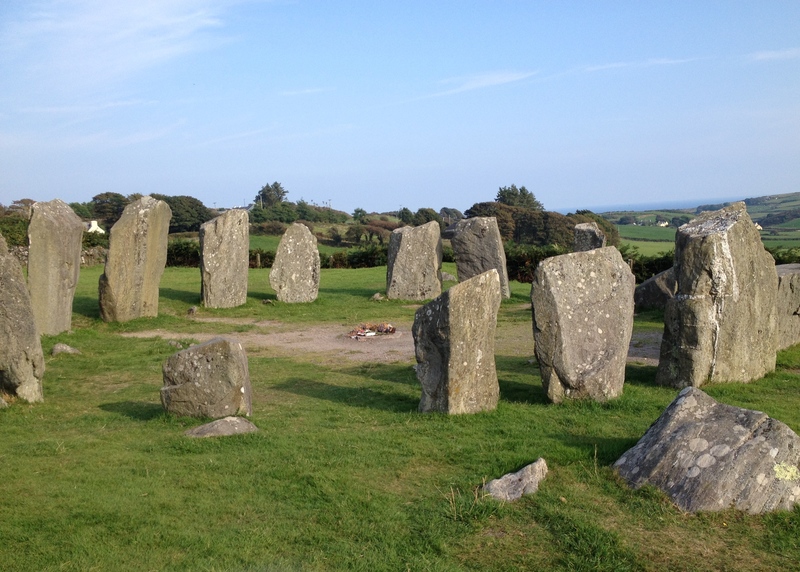 I was probably just exhausted—it had been a long day with the hike and my first stone circle. Between all of that and the full moon, I should have been howling crazy. Or maybe this was the beginning of not being crazy at all. When Neil asked if I was ready to go, I nodded. He took my hand gently, as if he knew something was inside of me that hadn’t been there before. 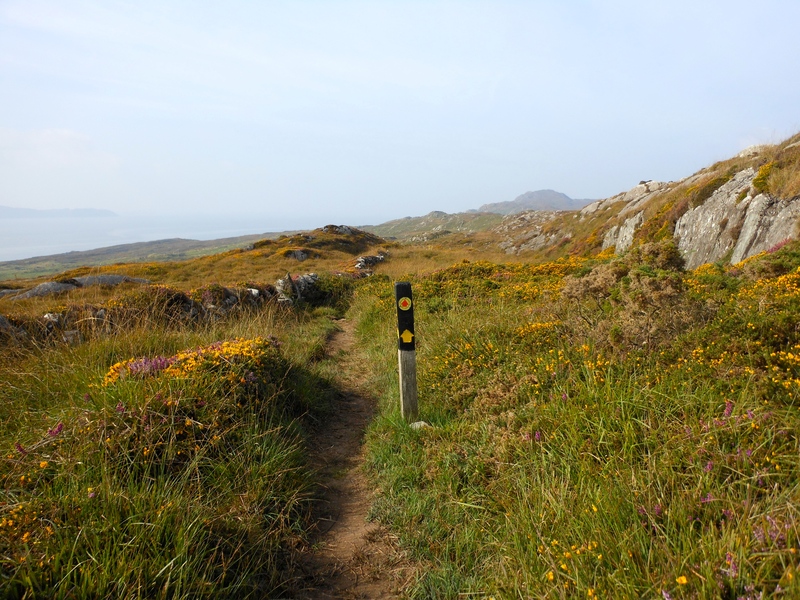 We walked back to the car, the stones of Drombeg disappearing behind a red-flowered bend.